The ‘demake’ is a subgenre that is quickly becoming famous among the indie developers. The idea behind drawing inspiration from a popular franchise from current times and creating a short game in all its sweet retro glory is an appealing one. We had games such as Call of Duty 6 2D and Pixel Force Halo and now Holmade Games created Bit of War, an homage to Sony’s acclaimed Playstation series God of War. 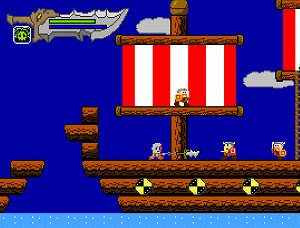 Just as the games mentioned, the revised genre of Bit of War is the retro action platformer, similar to the games that we used to play in the NES, including a retro theme soundtrack to fit the game. It’s more of a curiosity for fans of the series, who were wondering how Kratos would look like if he was the star of a game out of the 80s. Since this brutal warrior only begun his videogame career in the PS2, he was a full-blown character from day one. With the details scaled back – way back – the Kratos from Bit of War is more of a chibi version of the god we used to know, one that didn’t forget to bring his blades of chaos with his tiny self. As far as gameplay goes it’s standard platform fare but one that is imminently playable. There’s some genuine interest in finding out what kind of settings chibi Kratos will have to explore and what new enemies he will face, including some bosses that may take some time to defeat until we learn their attack and movement patterns. Kratos even has the medusa head to turn enemies into stone, but this ability is limited by the power available (it must be replenished by opening any blue chest). If you’re a fan of Kratos then Bit of War is one offer you just can’t refuse. It’s far from groundbreaking and the demake scene is not as fresh as it was a few years ago, but it’s free, so what is there to complain about?